In an increasingly digital economy, mastering the quality of data is an increasingly vital yet still, in most organizations, a considerable task. The necessity of better governance and reinforcement of international rules and regulatory or oversight structures (Sarbanes Oxley, Basel II, Solvency II, IAS-IFRS, etc.) imposes on enterprises the need for greater transparency and better traceability of their data. All the stakeholders in a company have a role to play and great benefit to derive from the overall goals here, but will invariably turn towards their IT department in search of the answers. However, the majority of IT systems that have been developed within businesses are overly complex, badly adapted, and in many cases obsolete; these systems have often become a source of data or process fragility for the business. 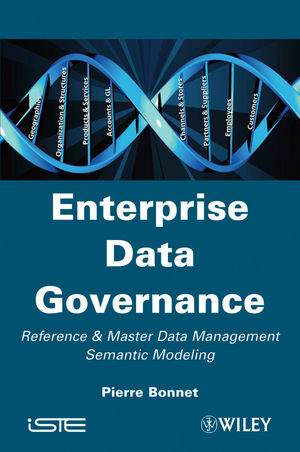 It is in this context that the management of ‘reference and master data’ or Master Data Management (MDM) and semantic modeling can intervene in order to straighten out the management of data in a forward-looking and sustainable manner. This book shows how company executives and IT managers can take these new challenges, as well as the advantages of using reference and master data management, into account in answering questions such as: Which data governance functions are available? How can IT be better aligned with business regulations? What is the return on investment? How can we assess intangible IT assets and data? What are the principles of semantic modeling? What is the MDM technical architecture? In these ways they will be better able to deliver on their responsibilities to their organizations, and position them for growth and robust data management and integrity in the future.